An often misplaced assumption made when working in an agile environment is that there is no specific Business Analyst (BA) role. Let’s take for example the well-known agile method of Scrum. 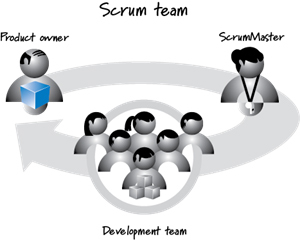 Scrum is often referred to as a ‘lightweight’ approach in contrast to, for example, AgilePM® (which is based on a subset of the DSDM® Agile Project Management Framework). Scrum, though ‘lightweight’ and simple to understand, is often viewed as being difficult to master. The Scrum team does not have a role specifically named ‘Business Analyst’. It is, however, essential that at some point if applying the Scrum method, someone must perform an equivalent function: think analysing and understanding the business, clearly defining business requirements, and identifying appropriate solution outcomes. The Product Owner is the ‘voice of the customer’ and key responsibilities include creating the vision, developing and approving requirements and user stories, continuously ‘grooming’ the prioritised backlog (think reviewing features, functions, and requirements), and ultimately accepting/rejecting products. Overall they represent the customer and are responsible for ensuring the Scrum Team delivers value. BUT, I can hear you say – hang on, wait a minute… In my current role as a BA I’m the one that helps define the products by gathering and correctly writing and defining requirements and facilitating discussions with the users/customer and the business. There is a large overlap with the Scrum Product Owner responsibilities and the BA role, however, the Product Owner has the added responsibility of representing the business and making relevant decisions on its behalf. In essence, there is a dual nature to the role – both as a business representative (authorised to make decisions) and as a business analyst. In a typical Scrum ‘one team, one product BAU situation’, the idea of ‘one Product Owner’ can work effectively and as intended. The Product Owner should ideally have sufficient business analysis experience and understanding, including appropriate training in both business analysis and the Product owner role. In a more complex project environment, the BA may be a member of the Scrum team, working with the Product Owner, specifically focussing on gathering requirements, defining requirements and facilitating communication with the wider business and customer community. This approach might even be a matter of necessity for many projects, given such work involves significant time and a high degree of business analysis skills. In the situation where the Product Owner role is performed by an individual who does not have the appropriate experience, skill, or even time to devote to such areas requiring analysis, this can be a significant risk to a success of the project. It is the skilled BA who has the understanding, tools, techniques and perspective to see the big picture, detail and end-to-end, as well as the ‘as is’ and ‘to be’ views.